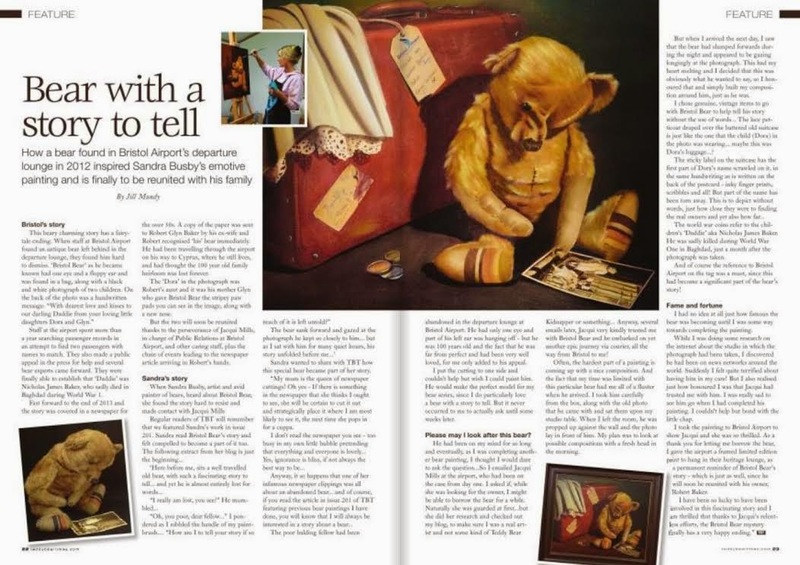 Remember the last time my teddy bear paintings were featured in the 'Teddy Bear Times' magazine...? Well, they've only gone and done it again! 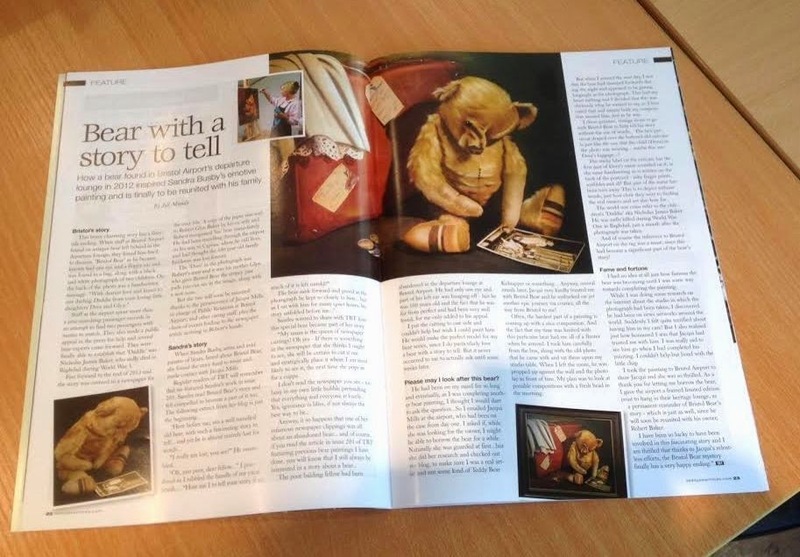 I was contacted a few weeks ago by the magazine saying that they had been told of the story of Bristol Bear and that they hoped I wouldn't mind sharing my part in the story with them. Anyway, naturally I wanted to share the news on here! I wish I could find a way of giving you a better image so you can actually read it! I have to say, it's a real honor to be featured for a second time! I am almost exploding with chuftiness!! So if you want a chance to win, watch this space! Congrats on the feature! I have to admit I think it's hilarious that there is a teddy bear times magazine but there is obviously a demand for teddy bear news so for you to be featured in it twice can only be a good thing to alert all those teddy lovers to your wonderful art! ! 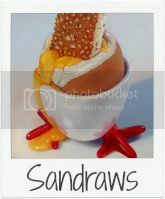 Well done Sandra - that is so cool! Shame we can't quite make out the text. By the way, I don't know what it is about teddy bears, but we have just had another teddy bear shop open here in Market Harborough! There are a couple of bear shops fairly local to us too Frank. You wouldn't think enough people would be interested would you! Congratulations, Sandra - it is such a compelling story with your painting brilliantly illustrating it and capturing the sad loneliness of the forgotten bear. I am so happy for you! Congratulations, Sandra!!!! I'm so excited for you...I wish I could read the article...! So well deserved, my friend...you are an excellent Bear painter...!!!! Thanks so much Hilda! Yes it is frustrating that I can't blow it up without it going all blurry! Wow! Congratulations Sandra, I'm really happy for you. It is a very deserved success. Hugs. Oh that's wonderful, Sandra! And it's such a lovely story, and so glad that you helped Bristol find his way home. Congratulations for your works,I like them so much!! 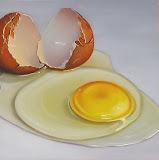 If you like come to my blog and visit my section "paintings"
Je viens aujourd'hui te féliciter pour ce qu'il t'arrive et c'est bien mérité car ton talent est grand ainsi que tes oeuvres... Vive les "nounours" ! Je suis content que vous avez trouvé bien après votre opération. I commented on this on FB I think but I have to comment again. Yay! It looks SO good. And it's such a great story. Awesome job. Yes it is exciting to see it in print. And it's going to be in another bear magazine soon too!